Many people think of space as a vast empty vacuum. In reality, it’s populated with hot ionized gases, known as plasmas, threaded with magnetic fields. The density of these plasmas is exceedingly low, so much so that, when space plasma physicists are asked what they study, they’ve been known to answer: “Practically nothing.” Nevertheless, the magnetic fields that thread these sparse plasmas store massive amounts of energy, which can erupt into tremendous electromagnetic space explosions when they interact. Southwest Research Institute (SwRI) has been conducting plasma physics experiments in the Earth’s magnetosphere for 39 years. In the early 2000s, the SwRI-led IMAGE mission captured the first global images of the Earth’s magnetosphere, adding significantly to our understanding of its interaction with the solar wind. Currently, SwRI is leading the science investigation for NASA’s Magnetospheric Multiscale (MMS) mission, which recently made the first direct detection of the source of magnetic reconnection, an explosive physical process that converts the magnetic energy in plasmas into kinetic energy and heat. 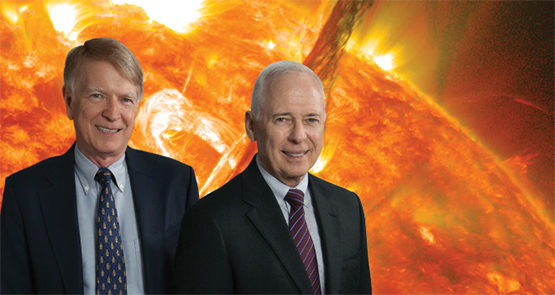 Dr. Jim Burch (right), vice president of SwRI’s Space Science and Engineering Division, is a renowned expert in space plasma physics. He is the principal investigator of NASA’s MMS mission. Dr. William Lewis has interests in a range of topics in heliophysics and currently serves as the MMS project manager. A constant stream of electrically charged particles — the solar wind — flows through interplanetary space. Their average speed is close to 900,000 miles per hour and their temperatures range from the hundreds of thousands to millions of degrees! So why, given these extremely high temperatures, is space cold? The reason is that interplanetary space is almost a complete vacuum, with an average of only about five solar wind protons per cubic centimeter. Heat from this minuscule number of particles doesn’t transfer effectively through conduction. The main source of heating in space is solar radiation, which plummets as distance from the Sun increases. Mercury, the planet closest to the Sun, has a surface temperature of 800 degrees Fahrenheit on its daylit side, compared with minus 400 degrees F on the sunny surface of icy Pluto on the outskirts of the solar system. Plasma is considered a fourth state of matter, having some of the attributes of the other, more familiar states of gas, liquid, and solid. In space, plasmas contain equal numbers of electrons and ions, which behave collectively and flow along field lines much as a train moves along a track. This motion of accelerated particles produces electrical currents within plasmas, which are shaped by magnetic fields. The sculpting of plasma by a magnetic field can be seen most clearly in coronal loops formed by magnetic field lines emerging from the Sun’s visible surface. SwRI uses the Earth’s magnetosphere as a giant plasma physics laboratory. The Sun emits a constant flow of plasma particles known as the solar wind, which is diverted by a teardrop-shaped bubble formed by the terrestrial magnetic field. These two forces create the dayside magnetopause, a rounded magnetic boundary between the Sun and the Earth. On the other side of the world, the solar wind drags the Earth’s magnetic field into a long tail on the night side. The Earth’s magnetosphere is populated with a plasma consisting predominantly of protons and electrons. The four identical MMS spacecraft fly in formation at the boundary of the magnetosphere, collecting data at incredible rates, looking for evidence of magnetic reconnection. Here, technicians integrate the 25-instrument payload into one of the spacecraft. Plasmas threaded with magnetic fields shape the Earth’s magnetosphere. They also populate the Milky Way and other galaxies. These magnetic fields are generated by powerful dynamos within stars and planets, and by the rotation of ionized gas in galactic discs. Magnetic reconnection occurs both in our solar system and in distant astrophysical systems. It lies at the heart of space weather and drives solar flares and coronal mass ejections, as well as disturbances in Earth’s space environment. These disturbances produce the northern and southern lights and, when severe, can shut down power grids and disrupt satellite-based communications and navigation systems. Reconnection is also an important phenomenon in laboratory plasma physics, where it is one of the impediments to achieving controlled nuclear fusion because of its disruptive effects in magnetic containment devices. Magnetic reconnection is a fundamental process in nature, at least in the 99 percent of the observable universe in the plasma state. In broad terms, the conditions under which reconnection occurs are well understood. When two plasmas with oppositely oriented magnetic fields come into contact, the field lines “break” on the dayside and then reconnect on the nightside, releasing energy and allowing the plasmas to mix. This process occurs frequently at the boundary of Earth’s magnetosphere. Earth’s magnetic field has a northward orientation: the magnetic field lines emerge near the southern geographic pole and re-enter near the northern geographic pole. The solar wind’s magnetic field, on the other hand, is highly variable. When it has a southward orientation, the solar wind and terrestrial fields are oppositely directed and can experience reconnection, allowing the solar wind and magnetospheric plasmas to mix and produce “jets” of accelerated plasma. That’s the big picture, observed and documented by previous space missions such as Cluster and THEMIS. But why do oppositely directed field lines break? How is reconnection initiated? What controls the rate at which it occurs? These are the questions that the MMS mission is designed to answer. Data acquired during the first six months of the mission suggest that the MMS team is well on the way to answering them and solving the decades-old mystery of reconnection. One of the fundamental properties of a plasma is that its constituent ions and electrons are tied to the magnetic field lines threading it. For reconnection to occur, the ions and electrons must become decoupled from the field lines, or “demagnetized.” Analytical theory and numerical simulations indicate that the critical and final stage in this process occurs in a narrow boundary layer, where the two oppositely directed magnetic fields meet and the physics is dominated by the electrons. The magnetic field lines of the Earth break and then almost instantly reconnect with solar magnetic field lines, allowing solar energy to flow unimpeded into the magnetosphere. This transfer of energy drives magnetic storms and dramatic auroral displays. It is this narrow region — the electron diffusion, or dissipation, region (EDR) — that the MMS team targeted to collect the enigmatic measurements needed to unlock the secrets of magnetic reconnection. MMS’s four identical spacecraft fly in formation at the boundary of the magnetosphere, collecting data at incredible rates, looking for EDRs. This artist’s concept shows the interface between the magnetospheric plasma, with Earth’s northward magnetic field, and the magnetosheath — the compressed and heated solar wind plasma — with a southward field. To the right is a close-up view of the reconnection region measured by the MMS spacecraft on October 16, 2015. The dotted blue line shows that the MMS spacecraft flew right through the event. An EDR is not an easy target to hit. Visualize a ribbon some 6 to 60 miles wide and extending many thousands of miles across the sunward face of the magnetopause, the boundary that separates the solar wind from magnetospheric plasmas. That may sound really large, but not when considering the vastness of space. The location and orientation of an EDR vary constantly with changes in the speed and density of the solar wind as well as with the direction of the solar wind’s magnetic field. As part of the mission planning process, the MMS team developed statistical models to predict where reconnection would most likely occur. The team then calculated how many times the four MMS spacecraft were likely to encounter the magnetopause and how likely these encounters were to bring the spacecraft close to a reconnection region. The models predicted that MMS would have about a 3 percent chance of coming within roughly 2,000 miles (about the distance between Los Angeles and Washington, D.C.) of a reconnection event — but not necessarily of encountering the EDR itself. If the EDR is the needle in a haystack, all the models could tell the team was where haystacks were likely to be found. MMS still had to locate the needle, and that involved more luck than design. Measuring the EDR plasma presents another challenge. The magnetopause is in constant motion, moving inward and outward at speeds of up to 100 kilometers per second, buffeted by the solar wind. Obtaining the necessary three-dimensional plasma data in a rapidly moving EDR requires substantially faster measurements than previously possible. Instead of relying on a single analyzer per spacecraft and the spacecraft’s three-rotation-per-minute spin rate to provide coverage, the team equipped each of the four spacecraft with multiple identical plasma analyzers. This approach allows scientists to make critical electron measurements from every direction a hundred times faster than ever before. This configuration does much the same thing for plasma physics as high-speed movies did for ballistics science: it allows scientists to see the step-by-step process of a magnetic reconnection event. But this approach generates massive amounts of data, more than can efficiently be sent back to Earth. Only a small fraction (4-5 percent) of the highest-resolution MMS data collected can be transmitted back due to downlink limits. The first cut at selecting potentially interesting data to download is made automatically by the instrument suite’s central computer. But because machines, however smart, are no substitute for a scientist who knows what to look for, the MMS team also implemented a manual data selection system. A “scientist in the loop” (SITL) examines summary data for interesting features that the automated system may have missed. The wisdom of this approach was proven early in the science operations phase of the MMS mission. Reviewing summary data from a magnetopause encounter on Oct. 16, 2015, the SITL identified the signature of a possible reconnection site — a jet of heated ions. It was a signature that the onboard computer had missed. Once the high-resolution data from the encounter were selected and downloaded, scientists began a rigorous analysis. The result: Not only had the spacecraft passed near a reconnection site — they had in fact flown through an EDR and made the first definitive measurements of the electron physics responsible for magnetic reconnection. MMS had found the needle in the haystack. Each of the four MMS observatories is octagonal in shape, approximately 11 feet across by 4 feet high. 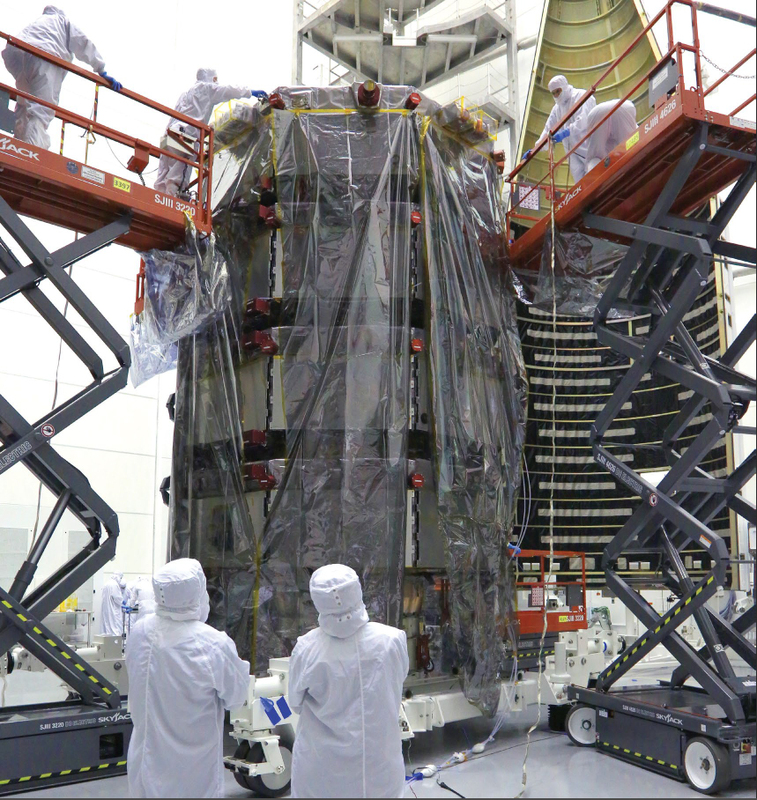 When stacked together inside the Atlas V launch vehicle, the observatories are more than 16 feet tall. So what happened when MMS sampled the dissipation region? As the four spacecraft moved along the boundary, MMS allowed scientists for the first time to visualize a reconnection event. Comprehensive data show what’s happening in this explosive event, not unlike how high-speed video can delineate events such as a balloon popping or a bullet penetrating armor. And MMS collects data at the very smallest of scales, looking at the electron populations that govern the reconnection phenomena. What did the electron sensors see? 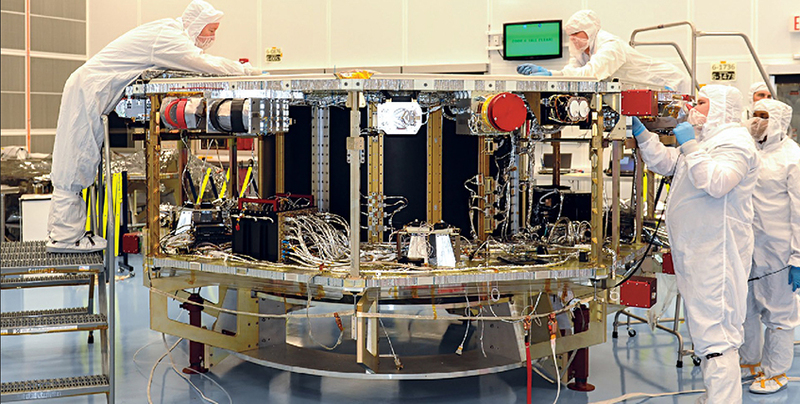 MMS measures the entire surrounding environment, measuring electron fluxes every 30 milliseconds. Previous sensors could only make a measurement every 4 seconds or so. The data contained more than 100 electron measurements; previous spacecraft capabilities could provide only one. This resolution is what opened up the new window on reconnection. Like most explosive events, reconnection is fleeting, so the high-speed MMS data allow scientists to map out the process at an electron scale. Examining the data from the encounter, the MMS team saw a drop in the magnetic field to near zero, oppositely directed ion flows, accelerated electrons, an enhanced electric field, and a strong electrical current — all indications that the spacecraft had entered the dissipation region. The telltale signature of reconnection, however, was a spike observed in the electric power generated by the electrons, like a fuse blowing in space. This “blown fuse” was the predicted “smoking gun” for reconnection, observed for the first time with MMS. As the electrons become demagnetized and the magnetic fields of the Sun and the Earth interconnect, solar wind and magnetospheric plasmas mix. 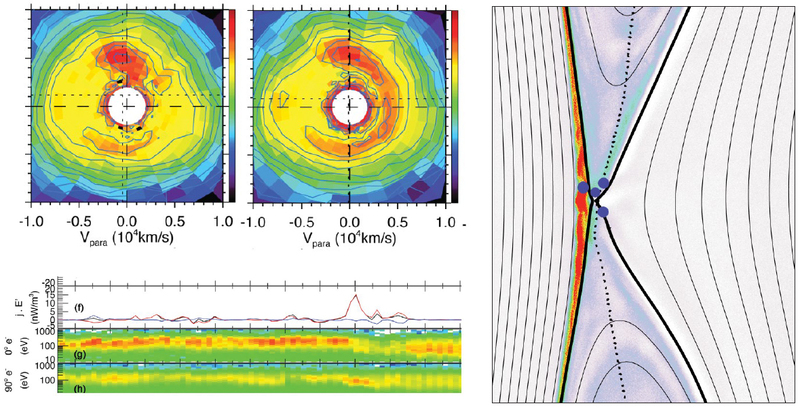 The MMS electron images reveal a distinct crescent shape of concentrated energetic particles when solar wind electrons penetrate the magnetosphere (see figure to the left). But they don’t stay there. These weave in and out across the boundary region, carrying the current and picking up energy from the electric field produced as part of the same process. Scientists had predicted these crescents in computer simulations but were surprised when data revealed that the crescents turned and flowed out along open magnetic field lines. This first measurement of the interconnection of magnetic field lines documented the occurrence of reconnection. The red spike in the line graph above indicates a burst of electric power generated by the electrons. This peak is the predicted “smoking gun” for reconnection, observed for the first time with MMS. The round data plots at top show electron activity. Simultaneous with this spike, the electron activity (shown in red), which is initially localized to the equatorial plane on closed magnetic field lines (left), rapidly turns to move along the newly opened magnetic field lines toward the Earth (right). This is the first measurement of the opening of a magnetic field line using electrons as tracers. At right: Three of the four MMS spacecraft (shown in blue) were located above the X-line — the location where the magnetic fields would have crossed if they had not been annihilated — while the fourth was located below the X-line. Launched March 12, 2015, the four identical MMS spacecraft skim the sunward boundary of Earth’s magnetosphere in a close tetrahedral formation. 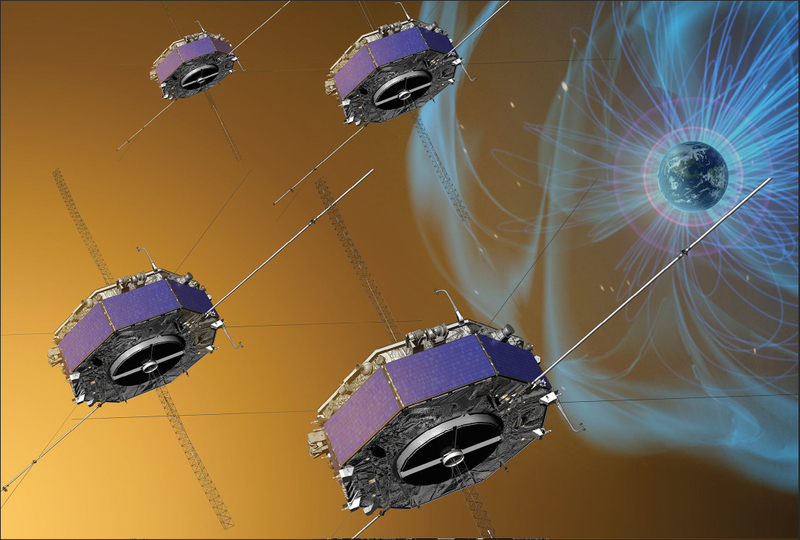 Each spacecraft carries a payload of 25 instruments to measure with unprecedented resolution the plasma, energetic particles, and electric and magnetic fields near and in magnetic reconnection sites. After its first measurements of magnetic reconnection, MMS spent the next five months searching for more such events during its journey around the dayside of the Earth. MMS has since measured eight more reconnection events, each having different magnetic orientations and plasma conditions, on both sides of the boundary. The next step is to determine how energy is transferred from the magnetic field to the electrons. Theories and plasma simulations suggest that dissipation of various types of electromagnetic waves and plasma oscillations are responsible. MMS data contain all the information needed to solve the cause and effect part of the reconnection puzzle. And the entire MMS dataset is publicly accessible, so a large international contingent of space physicists is involved in this quest. In September 2016, the MMS spacecraft began their second traversal of the dayside magnetopause before moving to the Earth’s nightside and magnetic tail. It’s in the magnetotail that field lines previously opened on the dayside are closed in an explosive manner — driving magnetic storms and auroral displays — while ensuring that there are no loose ends. Reconnection in the tail region is fundamentally different from that on the dayside. It is more symmetrical because plasma densities and magnetic field strengths are very similar on either side of the reconnection layer, while dayside reconnection is very asymmetric. The fundamental nature of reconnection will allow the MMS results to be applied directly to understanding reconnection in solar, astrophysical, and laboratory settings through theory and modeling. Because these settings are either inaccessible — solar and astrophysics — or too small — laboratory plasmas — for direct comprehensive measurements, MMS will provide key insights into these areas. Questions about this article? Contact Jim Burch via email or call +1 210 522-2526.